When I was in 5h grade, my mom asked me to put on a skirt and took me to a church one weekend morning. That was unusual. And so was (to me) the large group of nervous kids fidgeting next to their parents in the pews. Turns out, she had brought me to an audition for Youth Pro Musica, a Boston-wide singing group for kids who wanted to roll up their sleeves with serious music. Alrighty. Not having warning was actually a great strategy and a relief – it spared me many minutes of anxiety. Like a Band-Aid being removed my name was called – I sang the notes back to the tough cookie music director, lalala, it was kind of fun – and I was in. Soprano 1 reporting for duty. I was super into chorus as an elementary kid. We sang fun songs like The Night Chicago Died and Luck Be A Lady and our entire grade participated, whether you could hold a tune or not. These were pre-cool years and we just had unselfconscious fun. We belted out show tunes and our parents came to concerts (concerts were exciting, as were school plays and all that stuff) and rehearsal period was something I looked forward to. Singing felt like freedom and with my high voice I could soar on the top line. Soaring was something I sought as a kid, along with running fast, riding horses, shagging baseballs. They were all entwined. I wanted to see what I could do, to flex whatever power a young pre-pubescent girl could hold, to just gogogo. Youth Pro Musica was different. The harmonies were complex. The music was way harder to learn. But the sound, the sound. It surprised me from time to time. What was that? What is this? I loved the feeling of resonance in my chest, I loved the vibration when we harmonized together, and the moments I could hear myself, then the group, then my voice. I was carried along in a stream of sound. I loved, really loved, singing every piece. Truthfully, I never really paid attention to the words to anything I was singing. So often the words were in Latin or German or another foreign language – I had no idea and no interest in their meaning. Who cares? Seriously. On top of that, I had zero life experience at that point. My empathy threshold hovered around zero. It was the sound, the tempo, the mix and the dynamics we, I, thought about. Our music director never uttered a word about the heart or hurt behind any score. We were puppies, after all, who knew nothing. Callow would be the word I’d use. So many of the songs had a hopeful quality to them. The young writers were writing poems about nature like I was in elementary school; they, too, were drawn to the colors of sunsets and the memories of flowers. Their words began to unveil themselves to me but I did not venture far. I remained on the perimeter of this petrifying cauldron of the Holocaust, a topic I had not yet gotten near. 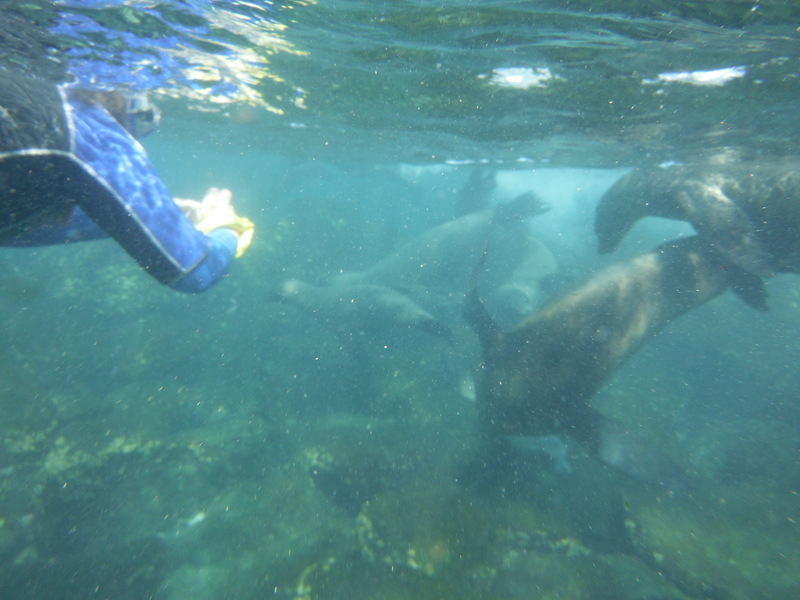 And from the start it was clear – these kids were brave, far braver than I. I liked them. And so, that night, we sang. There we were, kids the same age as the poets who wrote the verses that were hidden away before they faced their deaths. Their art was recovered after the war, a clear and specific last gasp. We sang their beautiful songs and the few biting ones; we eased into the music and as usual I was absorbed into it. 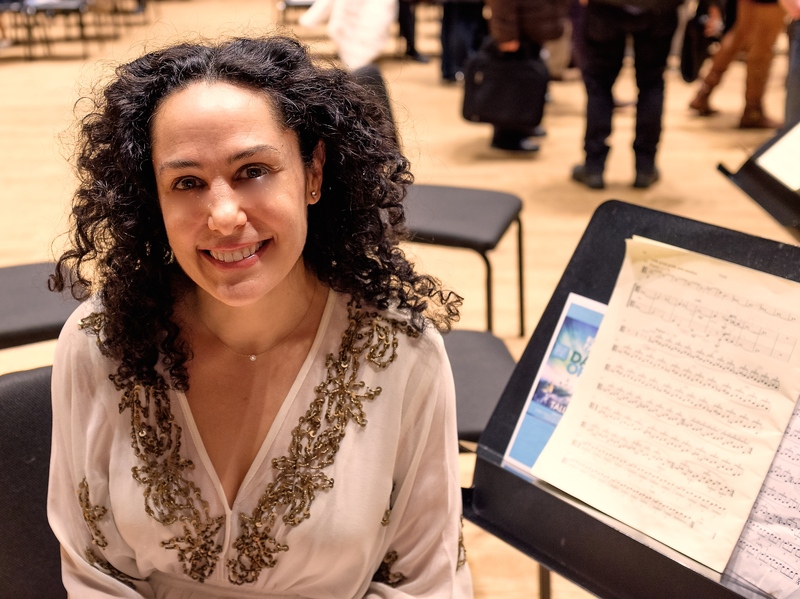 But when I looked out beyond my binder and past the baton of my music director, I saw that the large audience, filled with old people I did not recognize, was unusually serious. They were so focused it looked like they were praying. Some had closed eyes; some, more, were crying. This was not the reaction we, the cute kid singer posse, usually elicited. Had we done something wrong? Was this too much? I had a queasy feeling making these grown-ups so upset. As I sang I had to look away. Too many tears were streaming down my face to see the score. Perhaps, to them, we were their sisters and brothers. Perhaps we were their daughters and sons. Perhaps we are. I have never stopped singing. Machu Picchu! We also climbed the tall peak behind it, Wayna Picchu. Hi everyone. I’m recently back from a terrific hiking trip in Peru to Machu Picchu, The Sacred Valley and Cusco. AMAZING. I’ve traveled a lot and this was at the top of “wow” experiences. Machu Picchu is nestled in or above the clouds a few thousand feet up in the eastern Andes, and when you descend you’ll find yourself in lush Land and of the Lost jungle. This makes for a palette of blue sky and green green vegetation, rather a Rothko-esque landscape of broad swaths of color. Machu Picchu is up HIGH – eagles and condors circle nearby and one truly does have the feeling of being at the top of the world. Pardon me, have we met before? Calm and friendly llamas on Machu Picchu are the resident welcoming committee. And of those Incas. They really blew me away. No one knows exactly what Machu Picchu was used for but some scholars feel it was a mountain-top haven for Incan nobility, about 300 people, and the architecture shows evidence of numerous temples, astronomical viewing chambers, gardens, plazas and super-clever irrigation and farming terraces. Machu Picchu was built around 1450 and abandoned a 120 years later when the (devilish) Spanish Conquistadores were attacking the Incan empire and generally killing everyone in their path as they looted all gold. The Spanish never found Machu Picchu so it was preserved (and hidden for centuries by jungle overgrowth) instead of destroyed. With 9 of 10 Incas killed by the invaders, and the culture decimated by murder and disease, be thankful for small blessings. Inca salt pools. Built 500 years ago, these are still functioning today. This all sounds quite depressing and it’s true, it’s hard to shake the feeling of what if, had the brilliant Inca culture had more of a chance to thrive. When one arrives at Machu Picchu it is impossible not to be humbled and awe-struck. And the hiking, if you want it to be, is rigorous. The Inca must have been in terrific shape because narrow and steep stairs lead up up up to the peaks of the surrounding mountains, leading to incredible vistas of the entire valley and perfect vantage points for spying approaching invaders. Smart. The gorgeous Hotel Monestario in Cusco is in a 500 year old Spanish monastery, complete with dark and evocative Spanish religious art that reminded me of the Prado. They served a wildly elaborate breakfast in this courtyard. We were giddy. Yes, please! 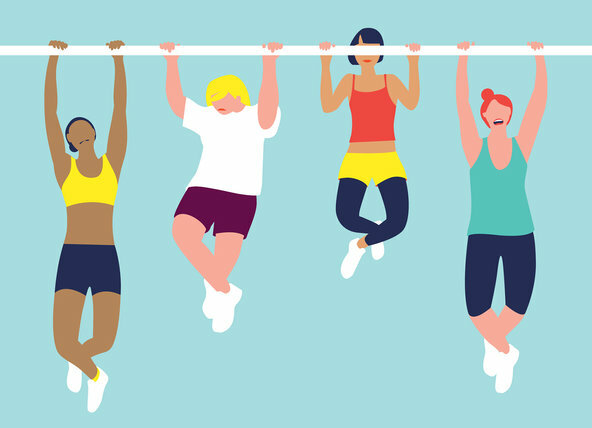 There’s nothing like feeling great in your body, feeling your heart beat strongly and asking your muscles to say, do a set of pullups or get funky in Zumba class, and look at that, motion! There you are! For me it’s a joy, and if you’re reading this blog (hello! and thank you), I’m assuming we’re sympatico. But over the years, with all of this focus on fitness, it really started to gnaw at me that I was neglecting a big part of my core, and a major muscle was moving past being simply flabby to becoming atrophied: my singing voice. My voice practically had cobwebs, my range was shot, and that feeling of over-the-top joy of letting loose and being part of making music was getting farther and farther away in my rear mirror. I’m a big advocate that if you use it you won’t lose it – study after study shows that staying active and keeping one’s muscles engaged slows the decline usually associated with aging. Inactivity is what leads to problems. And problems came… Singing It’s pretty much my best self, my inner voice made outer. Singing calms and comforts me and it is the perfect company if I need a friend, stat. I love its familiar sound and the vibration in my chest, the resonance, is almost like a massage. My soprano voice is a shadow I could always count on being right next to me, in lockstep with me through my life. I never really knew where it came from and I could always tap into it, so maybe that’s why I was careless. Time went by. I would sing another time, another time. Life got in the way. I was like the callow kid in The Giving Tree, and, well, over time, carelessly, I turned voice into a stump. And when two friends, Alex McKay and Julie Holland, from my college a cappella group, Counterparts, came over one night and we started to harmonize, just like old times, it was painful. I wasn’t soaring, lightly and effortlessly. I was cracking, I was dry, sharp. I was not the same singer anymore. Oh. No. *Hi again – I’m laughing a bit at myself with this burst-into-tears reaction but it’s true. Here’s a partial and random list of songs or pieces that rocked my world on first listen. No rhyme or reason, just emotion. What gets to you? I’d love to hear! 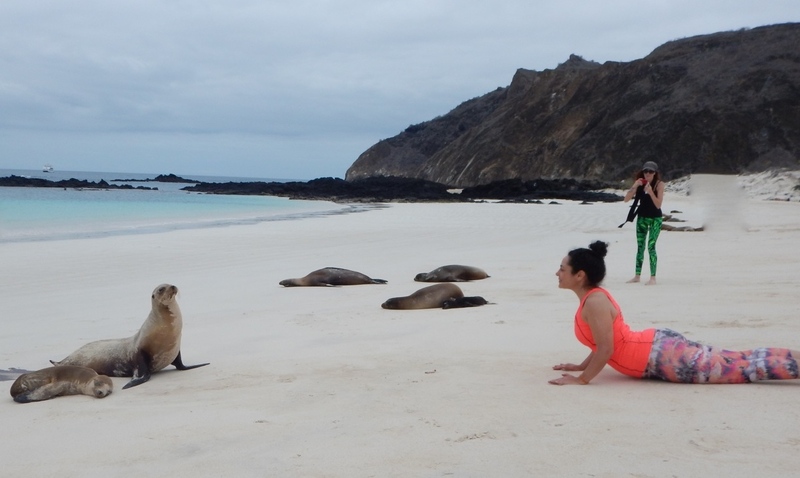 Hi guys, I’m just back from one of the best adventures I’ve ever been on – traveling around the Galapagos Islands and cavorting eagerly and often with the residents. 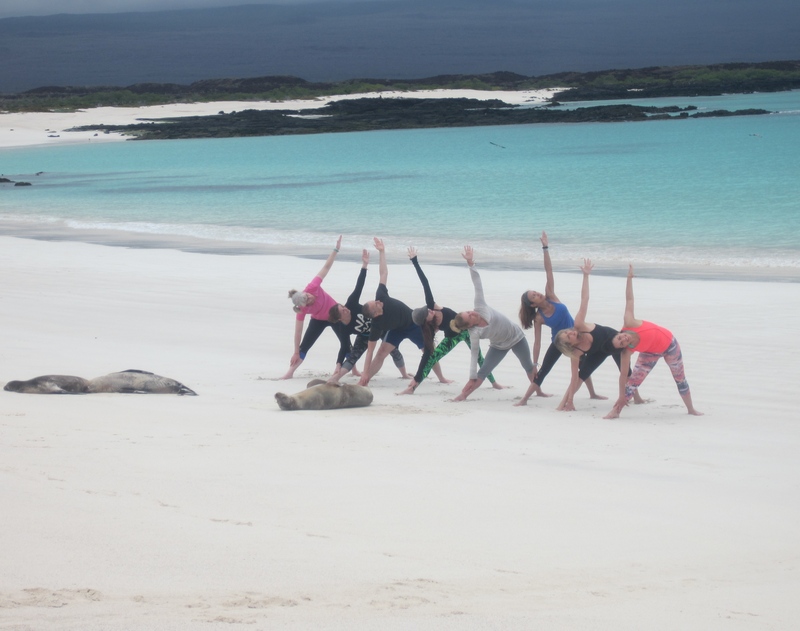 From kayaking, to snorkeling, scrambling across volcanic rocks, swimming, hiking across wind-swept beaches and daily doses of excellent Vinyasa yoga, we were in motion pretty much the whole time we were there, and somehow I still had time to pinch myself as each new vista pretty much took my breath away. Well hello, Mother Nature, it is wonderful to see you! 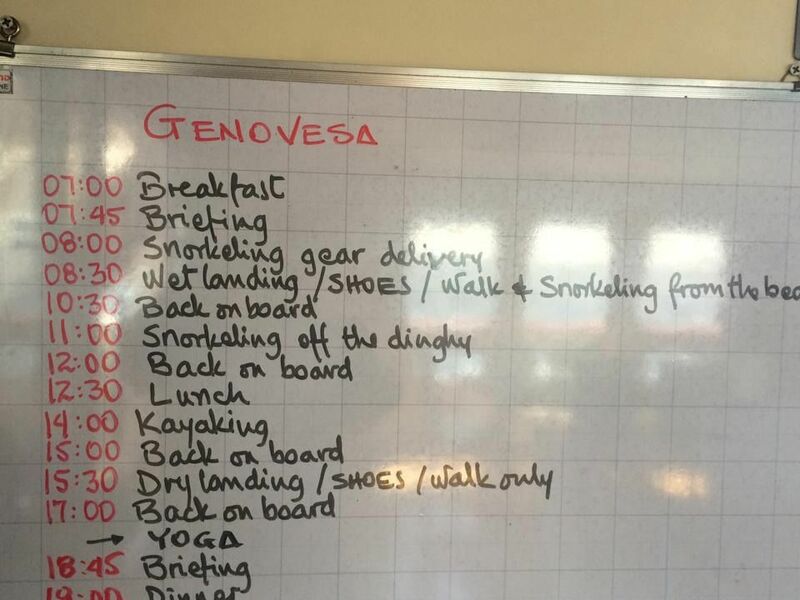 The “menu” for our day at Genovesa Island. 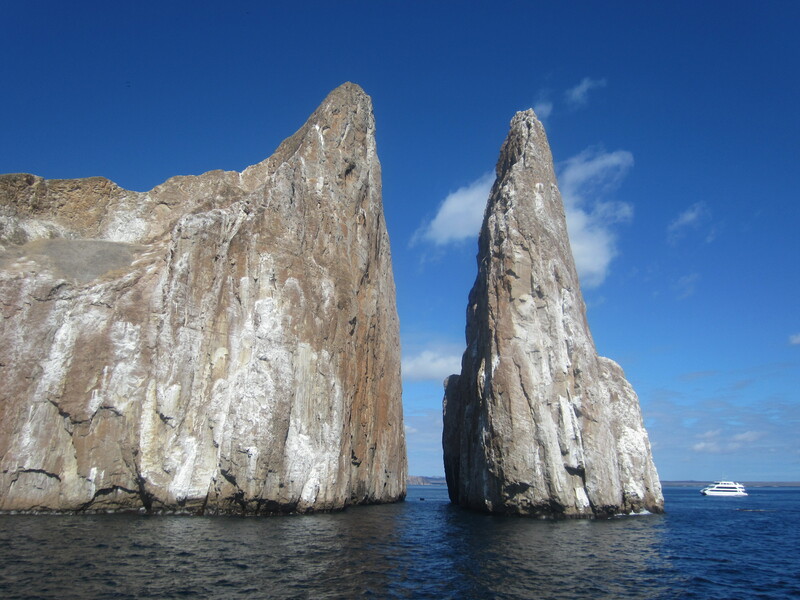 To be immersed in the wildlife, we toured the islands by a boat, The Majestic. We sailed by night and hopped in the yacht’s dinghies by day, scouting, searching, snapping away. Erica and Francesco of Escape to Shape lead us, a group of 15 up-for-anything/inquisitive folks, and, as always, they were fantastic hosts. 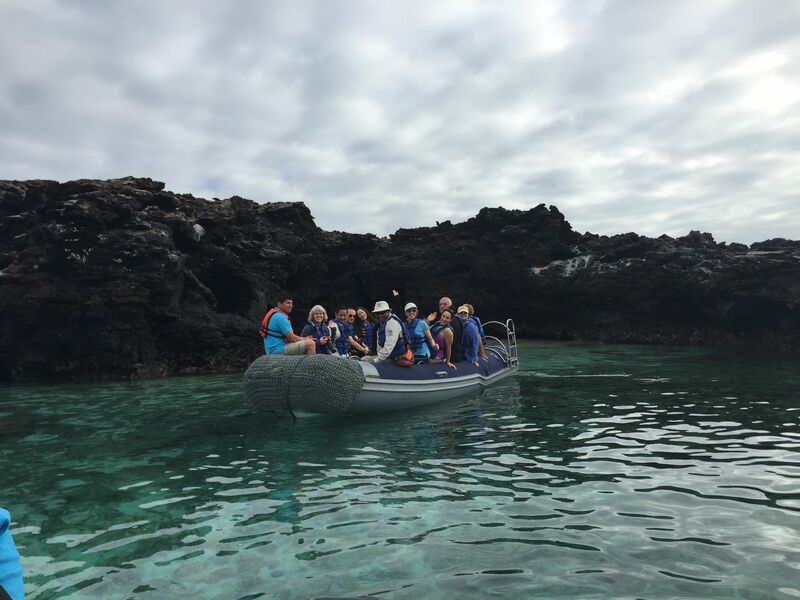 (I think I’m addicted to their trips as I’ve been to Laos, Istanbul, and Marrakech with them…) I’m happy to say, the Galapagos Islands are aggressively protected, so there were no crowds as we went from spot to spot. 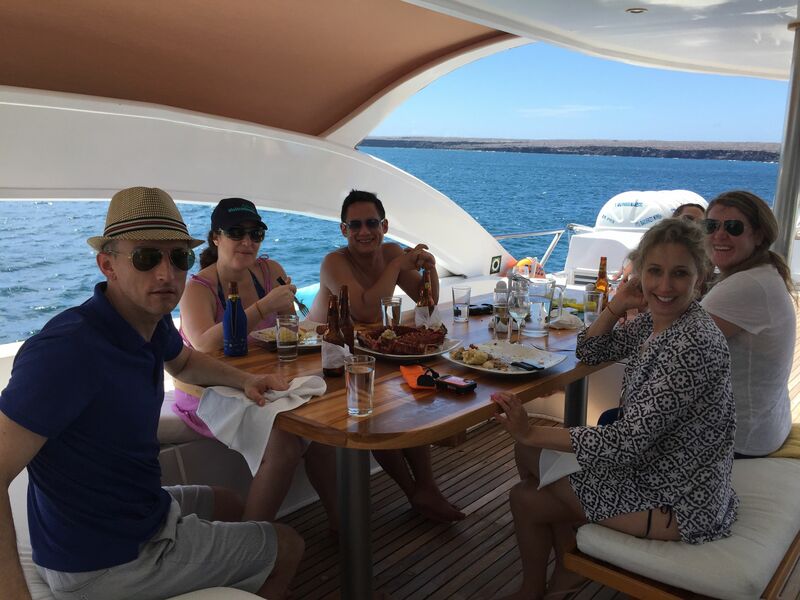 Yes, we were on a yacht but it wasn’t boom chacha chacha Puff Daddy style nor did any Carnival Cruise 4000 people monsters pull up next to us. We saw four other boats over the course of 5 days. 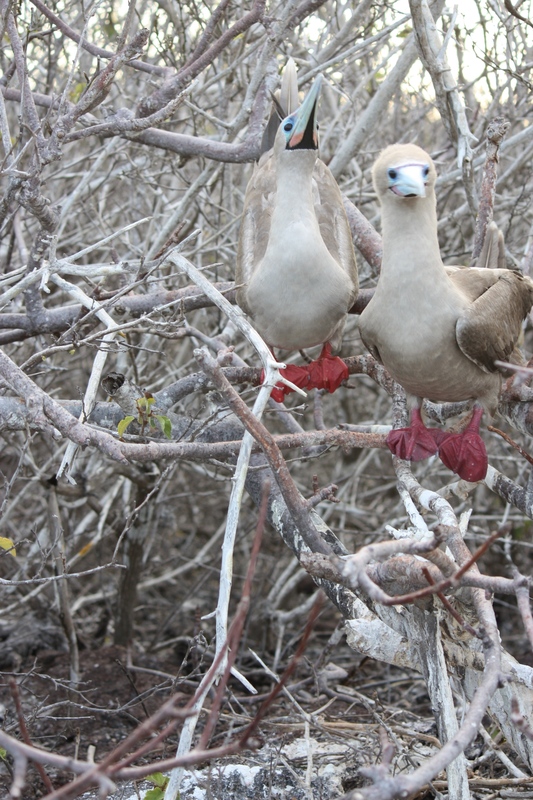 Our guide, Billy, an Ecuadorean naturalist with a number of masters degrees, plotted out our course with the Galapagos Parks system months in advance as space for each little island is limited and regulated (again, thank you!) in order to protect the animals. We made sure to ABSOLUTELY leave nothing on the islands but footprints in the sand, taking care not to touch anything as we could easily disrupt the delicate eco-system– which was really tough, as the adorable baby sea lion pups clearly pleaded with me with their huge eyes, “Please please please, put me in your pocket and take me home with you so we can be best friends forever! Let’s run around New York!” Editor’s note: Even though they are like tempting mini Sirens, and were so cute I was dying, I resisted 🙂 Temptation Island indeed! 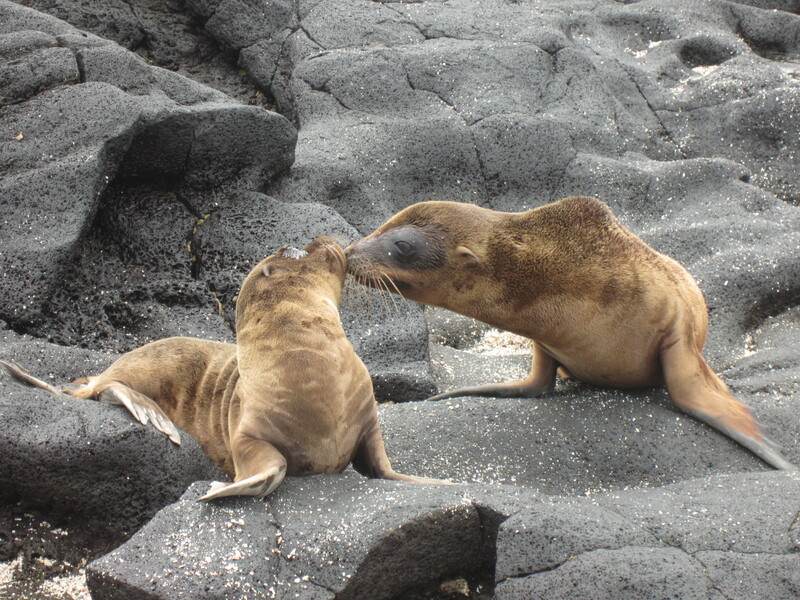 Seal lion buddy system. Let’s play! Super delicious and fool proof avocado toast. Oh avocado toast, how did I live without you? 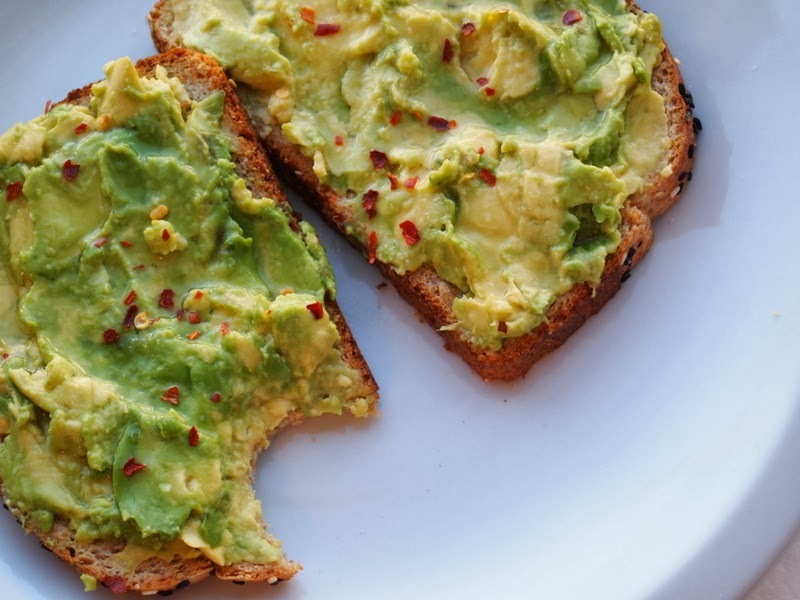 Last summer, my friend, Rachna, introduced me to what would become my go-to quick/tasty/lovely/NUTRITIOUS snack, avocado toast. It pretty much could not be easier to make and it’s satisfying and good for you. Boom. I eat it because it is straight up yummy. So without further ado, I am happy to pass along this miracle secret snack to you. Here’s the “recipe” – that word is a bit highfallutin’, as you’ll see. Seriously, how did I not eat this every day from college on? Toast the bread. Cut the avocado in 1/2 and split between the two pieces of toast. With a fork or a wide knife, mash the avocado onto the toast. Add sea salt and red pepper flakes to taste. This snack or breakfast has about 300 calories (that’s assuming the avocado is medium sized), a ton of fiber, 20 vitamins and minerals and a nice supply of healthy fat. 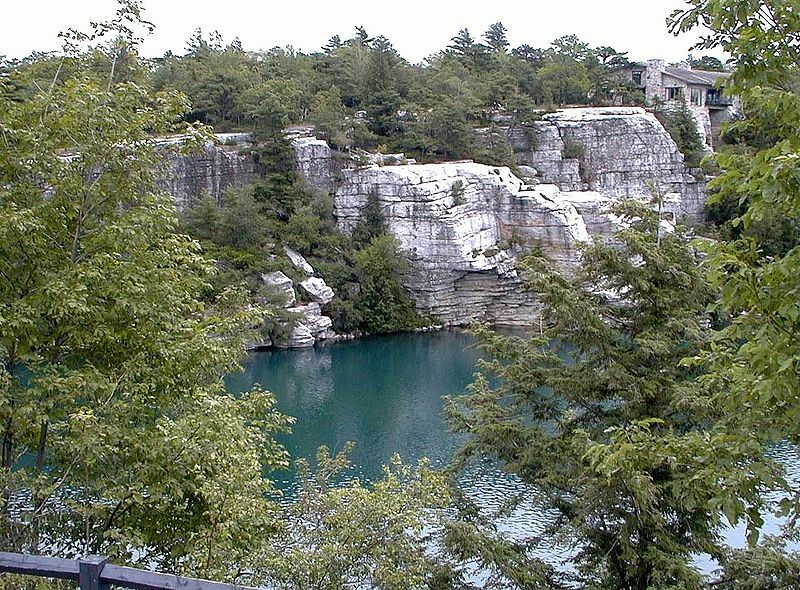 Lake Minnewaska. 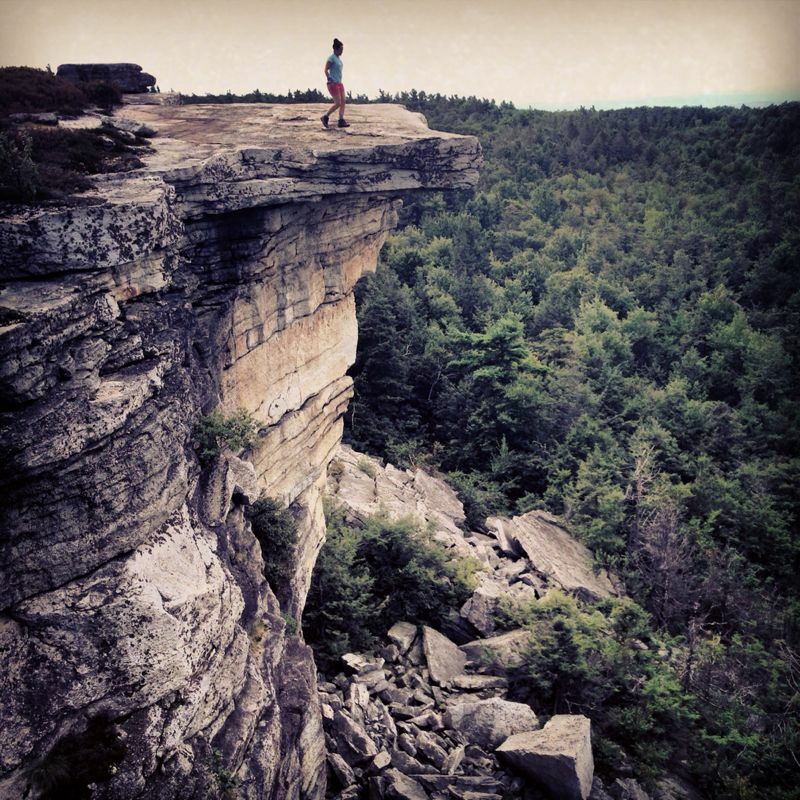 The most gorgeous start/end point of a hike ever? Got my vote. Tasty/healthy start – and my recipe has more colors and flavors. With my salads, more is more, baby! As a certified Saladologist, I am so happy TTO readers are trying the recipes I’ve posted and adding their own twists and improvements (Adam- apples in the Stephanie Salad? Nice!) A few people have asked for more recipes and I am happy to oblige – they’re speaking my language! Here’s what’s on heavy rotation chez moi this week: a salad of steamed broccoli florets (and some other veggies) served with protein-rich quinoa and raw cashews. It is super healthy, of course, but it is also hearty and substantial. -1/2 carton of grape tomatoes. Cut tomatoes in half. Let cool – I put it in the freezer for say, 30 mins. While it’s cooling, cut the florets off of a head of broccoli and chop into bite-sized pieces. Steam until they are soft (not mushy) and still have a bright green color and some crunch (don’t steam them to death or you’ll lose nutrients and flavor.) Run them under cold water to stop them from cooking when they’re done. Dressing: Mince the garlic. Add the lemon juice, vinegar and olive oil and wisk until combined. Add salt and pepper and red pepper flakes to taste. 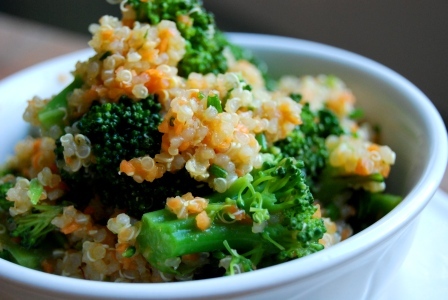 In a large salad bowl, toss quinoa with broccoli, other vegetables and cashews. Add dressing and toss again. Add more salt and pepper to taste and if maybe also some fresh herbs. Let the flavors mix before serving. Think of this as the bones of the recipe and throw in or substitute anything you want: add raisins, olives, feta cheese, replace broccoli with spinach or red leaf lettuce, use almond slivers instead of cashews…the possibilities are endless. If you want to go all out with flavorful quinoa, try Mama Jo’s Crowd Pleaser recipe – loooove it. Hi everyone. A story on the cover of the NY Times today made me do a happy dance – check out this super-inspiring profile of a Ghanese-American bodybuilder who, with patience and kindness, trains folks in their 80’s and 90’s, and helps them regain mobility, strength, and a big ol’ sense of happiness. Nice work! With his enormous muscles bulging beneath a small T-shirt, Martin Luther King Addo guided one of his most dedicated clients through a squat exercise inside his tiny Manhattan gym. “You can do it, Shirley,” he said. Shirley Friedman, a silver-haired 90-year-old standing 4 feet 9 inches, shifted into another gear, bending at the knees for multiple repetitions. I want to be him when I’m older, seriously. Maybe I’ll be a gym volunteer! Much has been said about exercise and aging, but it’s one of my favorite songs so I’ll hum a few bars: muscles and bones respond to exercise like a parched plant that has just been watered. They drink it up, and it’s never too late to get moving. NEVER. 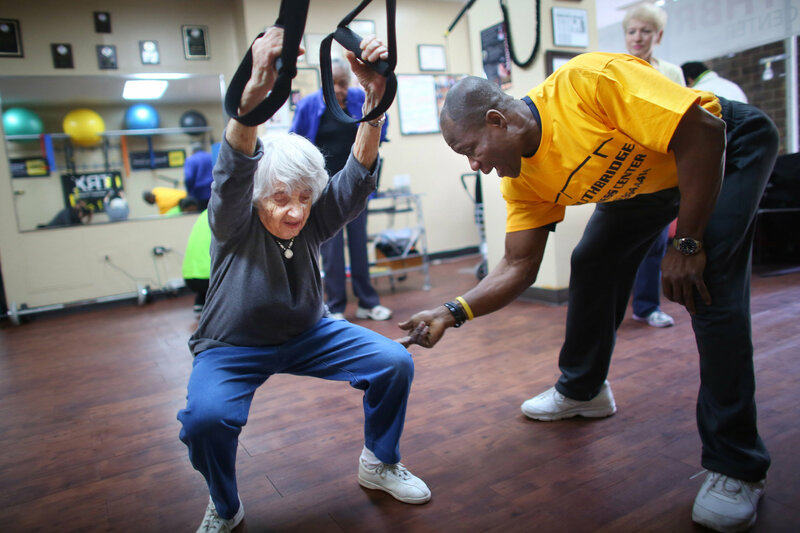 Check out this classic study from Tufts University – researchers introduced weight training to immobile patients at a retirement home and after a few months folks were up on their feet, dancing. Or look at my gal, Olga, who competes in track and field events at age 94. Amazing. On a more pragmatic note, if you want to fit in your skinny jeans for the long haul – and feel good in tank tops – work them muscles regularly. Nothing preserves muscle and health like exercise, and though you can rebound if you take say, a few years off, it’s always harder to come back than to maintain where you are. Keep exercising and you’ll stay strong throughout your life or put another way, get off the couch and you’ll stay off the couch. Here’s a link to a touching video of Mr. Addo and Shirley. Love it.